This morning 30,000 runners will compete in the Boston Marathon. The race is one of the oldest marathons in existence. When the Boston Marathon was established in 1897, women were not allowed to entered. This did not change until 1972. Girl Running, a new picture book biography of Bobbi Gibb chronicles the story of the first woman to compete in the Boston Marathon. 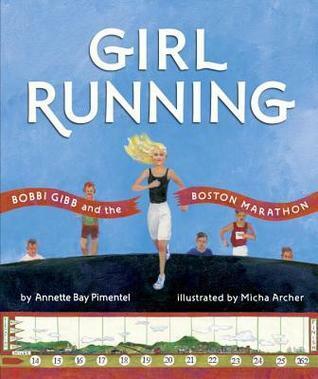 After introducing readers to a young Gibb who loved to run, the story shifts to 1966 when Bobbi Gibb was denied entry to the Boston Marathon because of her gender. This didn't stop Gibb. She put on a large sweatshirt and joined the race near the start line. Pimentel describes the excitement and of Gibb running the race in unofficially as she's cheered on by onlookers. 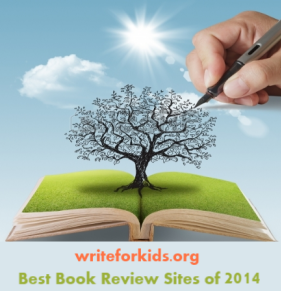 The text is simple and accessible to young readers. Archer uses different textures and patterns using oil paint and collage to show movement and motion. Don't miss the Afterword which contains more information about Gibbs and the history of women running in the Boston Marathon. Read aloud Girl Running to children of all ages. It is sure to spark discussions about gender equity and how one person can make a difference. Loved this one, as a former runner (never a marathoner though), and a former MA resident!! Thank you for highlighting Girl Running! I got to attend the (very cold and rainy) Boston Marathon this year and was struck by how many women were running. It was thrilling to think about how the world's changed so quickly.